Meat free week or freaking meat week? 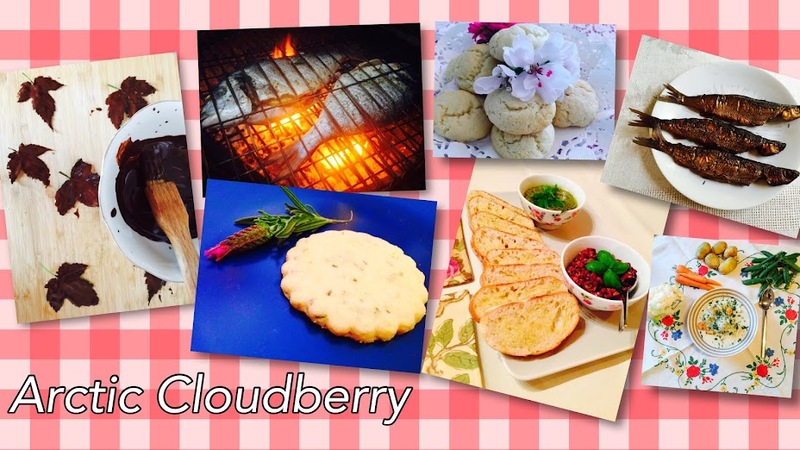 - Arctic Cloudberry Arctic Cloudberry: Meat free week or freaking meat week? Meat free week or freaking meat week? It's meat free week! I thought it would be a nice idea to take part in the challenge saving animal lives and unburdening the environment whilst reaping gastrointestinal health benefits! I was vegetarian for over 20 years after all, so this should be a doddle! I thought I will allow some fish, not to shock husband too much and then maybe in future do a veggie day regularly, maybe once a week at least to start with. Monday morning I forgot about the whole thing and put Bresaola in husband's lunch sandwiches. Yes, I make him lunch sandwiches, healthy whole wheat or seeded bread with cheese, meat (will introduce more salmon/other fish in future) and tomatoes, salad or cucumber every morning like a good wife should. Monday evening he ate Sunday’s left over duck because I didn't want to bin the lovely duck. That would not have benefited anyone, least of all the duck who'd generously given us all those lovely legs. I can't remember what I had for lunch, it was such a busy day at the office, but I fear it may have been a chicken and salad baguette from the sandwich van. But for dinner I ate Sunday's leftover salad provencale and goat cheese stuffed peppers. Yay for me. Tuesday I don't know what husband ate for dinner, but I accidentally put some smoked beef in his sandwiches. I subsequently decided that husband's lunch sandwiches are not part of the meat free challenge. He is a man after all and can't be expected to eat lettuce 24-7. I had a nightmare work trip to Middlesbrough through Darlington, which sounds sweeter than it actually is. Or maybe not. The trouble with train travel is that you see all the horrible backyards with car carcasses and wonky green plastic garden furniture from 1980s, corrugated iron warehouses and empty industrial plots, maybe allotments if you're lucky. And when you get off the train, around the railway station is usually not the prettiest part of town. The first thing I saw when I got out of the station in Middlesbrough was Kalinka Vodka Bar which looked even less attractive than it sounds. On the way back my train was delayed because of a person walking on the tracks. If you ask me they should have just driven over him (he probably was a callous meat eater). I popped in the Pumpkin Cafe, I was starving. I had a chicken (oops) ciabatta, completely forgot about the meat free malarkey. I think husband had resorted to moose samosas from the freezer. Almost vegetarian as the moose grow in the forest. I thought, OK, maybe Tuesdays are not part of the meat free challenge. Wednesday it was turkey sandwiches for husband as sandwiches are now exempt. 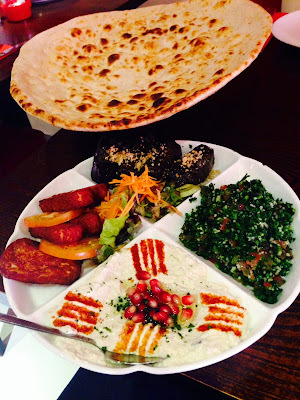 My lunch was vegetarian - lovely mezze at Iranian restaurant Manoush in Bayswater: hummus, dolma, halloumi, baba ghanoush and tabbouleh. I later found out that on top of my healthy although meat containing sandwiches husband had a Chinese buffet take away box containing lemon chicken and I'm sure lots of other not strictly meat free elements. Oh dear. So far not so meatless. Half the weak gone and a lot of poultry consumed, a whole flock of birds between the two of us. 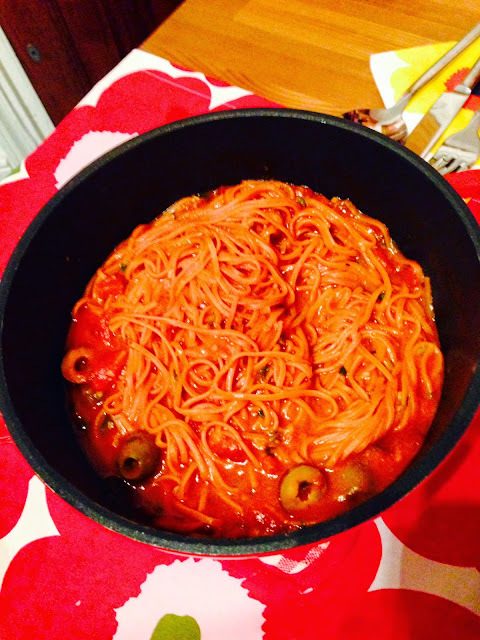 I decided on Pasta alla Puttanesca for dinner, tasty and veggie apart from a few anchovy fillets, 8 actually. The remaining four I just ate from the tin because they would have just smelled in the fridge for the next couple of days and then I would have chucked them. Yum, I like anchovies, salty though. Alarmingly 6 entire animals consumed. 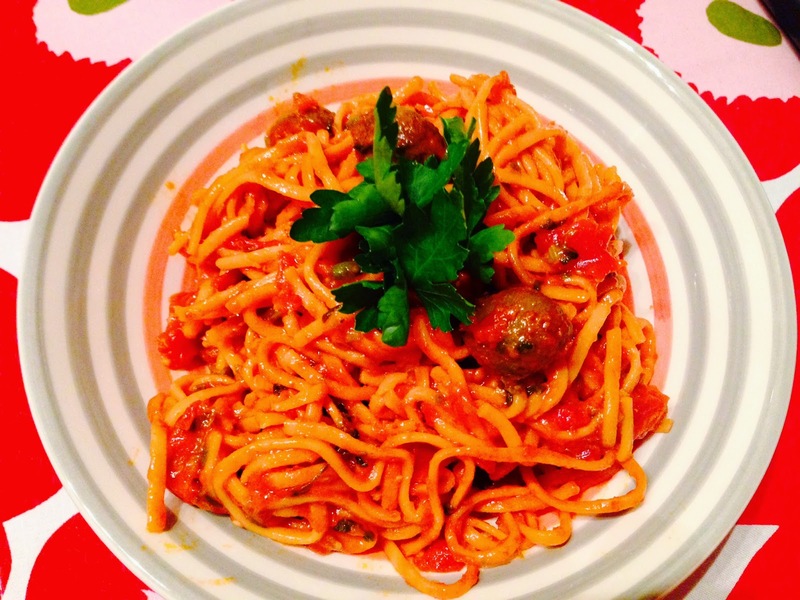 I had gorgeous bright red tomato linguine from a little delicatessen in Notting Hill (Valentina) that went well with the sauce although the colour faded when I boiled them and it didn't taste any different from the normal stuff, so in the end not sure if worth 4 times as much as normal supermarket pasta. We have both had some bad news from home this week and it's hard when you're far away, so we ended up finishing a bottle of red wine whilst crying into our pasta bowls. But at least well done for the first fully meat free meal of the week! Heat oil in a pan, add chopped anchovy fillet and fry until anchovy has melted into the oil. Add minced garlic and pepper flakes and fry for a minute. Add capers, olives, tomatoes and sugar. Bring to boil. Check seasoning and add salt and pepper if needed. If too thick add some of pasta cooking water. Serve with pasta.